Aplicando las medidas de prevención correctas evitarás que los plátanos se dañen o infecten. The banana protection bags are the main responsible for making these tasty fruits reach our hands in the best possible condition. Not only in terms of taste (obviously we all want the fruit to be at its best) but also in terms of the presentation and the life of the product. Many times, it has happened to us that when we are acquiring a hand of bananas, within these incredible fruits can be some that are not quite ripe or on the contrary, they are too much mature and at the time of eating are two points in which our expectations fall on the ground. With the first situation can be generated uncertainty and even concern about whether it is advisable to eat a fruit without being fully mature, while with the last one will simply generate displeasure or depending on the degree of maturation could cause nausea due to the texture and smell of the fruit. 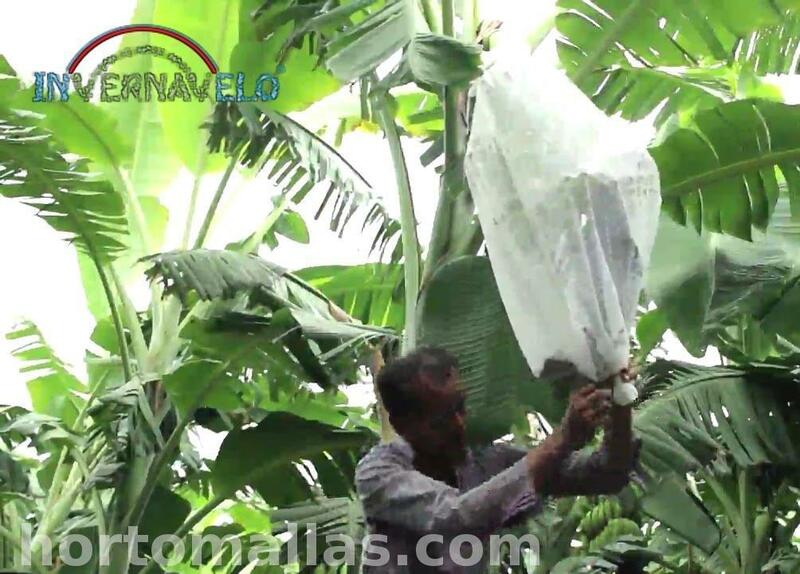 It is easy to install banana protection bags with INVERNAVELO frost blanket. When this happens, it can be due to two things: One, perhaps the shipment of bananas did not occur in the right way and the fruits were clubbed during the trip or the temperature needed for transportation was not adequate, which it decreases its quality very much and makes them reach their destination in a deplorable condition. The second is that those in charge of growing bananas simply to save a little money, avoided using any type of tool to protect and raise the quality of their product, which is, perhaps they never used a banana protection bag, or they skimped a bit when it came to properly using insecticides. On the other hand, if the bananas are removed before their predisposed date of maturation, the results will be unfinished products for all consumers; obviously, it is a problem that we want to avoid. Thanks to these banana bags, we obtain higher quality bananas. When it comes to avoiding this type of mishaps, the banana protection bag will be your best friend. Many companies use versions of these bags that are not biodegradable, that is, those plastics completely covered in chemicals that undoubtedly serve to protect the desired product but eventually end up contaminating the environment due to the difficulty in getting rid of that material. However, our bags of fabric will allow you to obtain all the benefits of those plastic banana bags but with the great advantage of taking care of the environment once they have finished their useful life and making the disposal process much easier and more conscious. Now, the banana protection bags allow carrying out the bagging activity, which is important for any banana industry or any independent producer because it avoids, apart from the problems mentioned above, that the fruits deteriorate due to the ravages of the weather, whether they are blizzards, sun or heavy rains. Any of these climate changes will cause the quality of bananas to deteriorate regardless of their type or size, which is why it is so important to keep them safe. In case of very strong climates such as those where the temperature is incredibly high during the day and plummets during the night, both the growth and the quality of the bananas that are going to be obtained may be affected, for this reason all the crops in the area must be in constant observation because some hectares may be more affected than others. El material de la tela es super resistente, por lo que los plátanos estarán bien protegidos de las amenazas externas. Fortunately, the material from which the banana protection bags are made is strong enough to protect the fruits and at the same time protect itself, because it would not be worth a bag of little resistance that would endanger your investment and its crop at the same time. 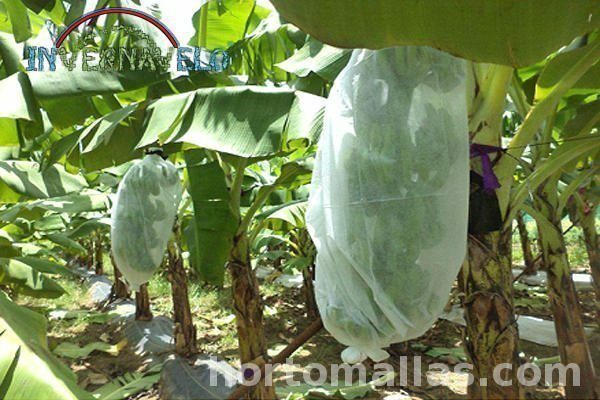 The ventilation offered by the banana protection bag will help regulate humidity or in opposite case, the lack of humidity does help problem since it will keep the temperature at a stable level, that is, a comfortable microclimate will remain in the bag until it adapts to the next climate change. For this, it is sometimes recommended that the bottom of the banana bag be kept open although this may require even greater supervision, but if the climatic conditions warrant it, it is better safe than sorry. It is also recommended to wash the fruits and leaves before placing the bag for bananas as this will greatly help to prevent the appearance of possible diseases and pests in bananas. Usually withered leaves or drier ones should be removed to avoid this type of eventualities. However, we must take into account many things, such as the shade that it can be offered to the cluster, since the cutting of a banana leaf can make the direct light very invasive, even more so if the direction of sunlight comes into contact most of the day. 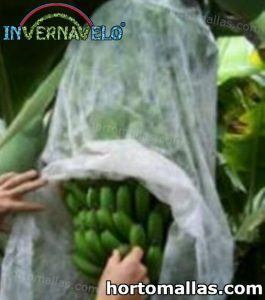 Banana crop protection with frost blanket. 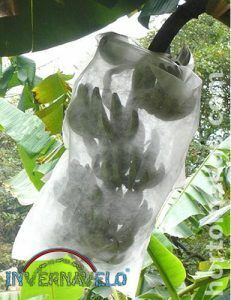 It must be taken into account that the leaves can protect the bunches of bananas, but we must acknowledge that they can also be dangerous for the production because they tend to heat up in such a way that they can cause burns to the fruits even through the bananas protection bag. Our bag has a transparent color that helps UV rays not directly affect the bananas, which allows them to avoid sunspots, and still obtain the necessary nutrients for proper growth. 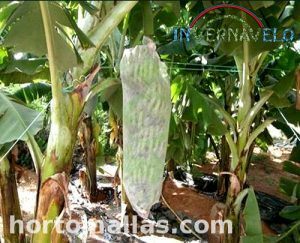 The banana bushes that are formed from the underground roots, are known as paradisiacal muse and as do not have a trunk per se, is given the connotation of shrub or large plant which can reach a height of 7 to 8 meters according to the quality of the soil in which it grows. This height allows it to be out of the reach of some animals but nevertheless there are many others that are able to steal the fruits of the plant easily, being the most inopportune those with the advantage of flying. These can easily pierce bananas with claws or peaks and possibly destroy a whole harvest season, leaving only losses in both monetary and emotional. 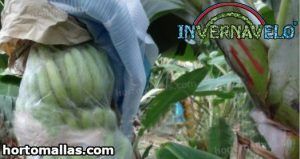 The height is usually comfortable enough to install our banana bag because it is usually rare for the hectares that reach their maximum height. Regardless of the height of the muse, the application of insecticides is vital, as we mentioned earlier there are certain diseases that can affect bananas in particular and different ways such as insects, bacteria or fungi produced by excess moisture, transmitted diseases. The most dangerous are the moko and the black sigatoka, whose alterations can cause the leaves of the paradisiacal muse to dry out abruptly and the growth of the fruits to come to a complete stop, another reason why the use of the banana protection bag is so important, is although the agents go around their hectares, with a good protection and an honest and dedicated application of insecticides the plagues will not be a problem for their production. Regarding the type of bananas that can be grown, it is important to be well educated because sometimes they can be so similar that we do not know the type of product that we will obtain and this in the long term is serious. The simple fact of not knowing what we are cultivating can lead the producer to make serious mistakes such as not calculating the growth radius of his crop. We have all seen the differences in size that bananas can have; and not only that, they can also vary in the growth flavor curve and other peculiar characteristics. Obviously, for a plantation that is just beginning to grow and mature it can be difficult to detail accurately the product you will obtain, it is easy to detail if its color is green or yellow, but this is just the first sign that a bunch of bananas can give us. For those who already have years of experience they will know that preparation is the key in the cultivation of bananas because there are certain types of this fruit that may be more susceptible to diseases for example, or that may have a more prominent curvature than other types of bananas. 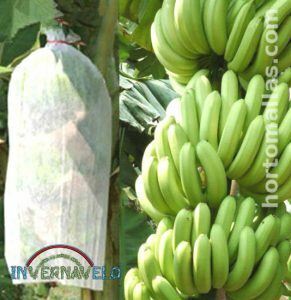 Bunches of bananas with frost protection INVERNAVELO. Regarding the appearance there are many features that can be several but nonetheless there are also features that escape from view. For example, experiments are often done with certain chemicals that allow certain hectares to grow with greater prominence, this causes bananas to obtain a much larger size, however this can be counterproductive if the expected length is not taken into account. Let’s say we do a bagging process to one of these bunches that are being subjected to quality tests, and the expected result is the increase in weight and size for each hand of bananas, if such growth is not taken into account, the space that is going to cover the flowering of the fruit will go beyond the capacities of the bag for bananas that we are using. An event like this can expose the defenses of crops, in the worst case drilling the bag and ruining the investment that was made. It can also happen that the resistance of the bag is opposed to the growth of the fruit, which would cause them to grow irregularly, even if they are ruptured, punctured, or bruised, which could quickly generate diseases in the complete bunch due to decomposition. In this case the ideal would be to be clear on the type of bananas you want to produce from the beginning, as we already know the large number of problems that we can avoid simply with this. On the other hand, it is not uncommon for the product produced to be planned well in advance, as well as the alterations it may have, whether they are genetic alterations that allow faster growth, or that the fruits grow to a certain extent so that they do not have a problem with the bags that will protect them, or perhaps alterations in color or in their hygienic properties. The most common worldwide are normal bananas, male bananas and dwarf bananas; the first two are in their varieties in green and yellow, because there are some dishes that are made with unripe bananas, that is, those that are green and with a much harder consistency and without having the sweet taste that usually characterize Dwarf bananas are a much smaller species than normal but they contain a much sweeter flavor than normal bananas. This blanket for bananas allows the passage of light by 90%, in addition to being stabilized against UV rays. When using a banana protection bag it is important to know everything related to the fruit, this also includes the technological advances that have been made and can avoid many headaches. Even if you are a person concerned about your crops, you also have to be responsible and dedicated so that your goal is achieved perfectly, remember, the protection, quality and safety of your crops will never be something to take lightly.